iCE3™ lets you move beyond the limits of traditional protein analysis and fast-tracks your development timelines. 10-minute start to finish run times let you optimize method conditions in an afternoon. As an added bonus, you can use the same generic method for multiple molecules—no need for product-specific methods. 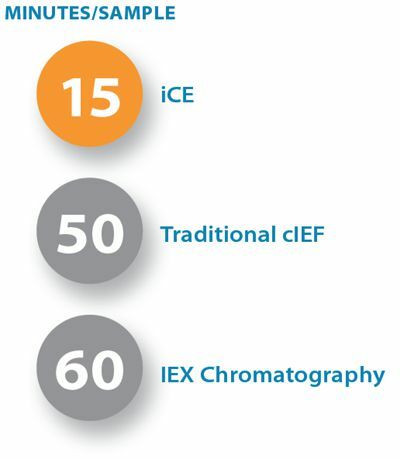 iCE3 gives you high resolution, quantitation and automation without the hassles that come with other capillary IEF protein separation techniques. 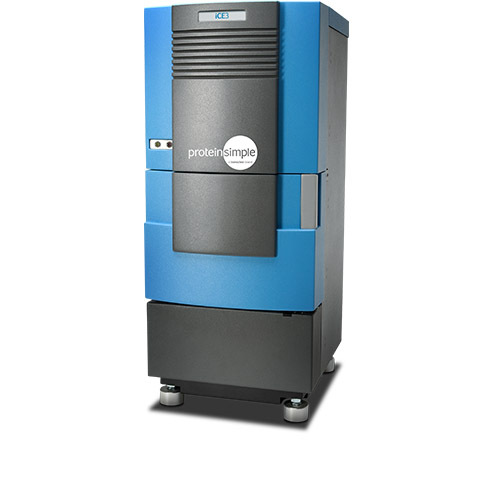 It'll analyze your toughest samples and most challenging proteins with ease. iCE3's 10-minute start to finish runs with the HT Cartridge lets you optimize charge heterogeneity method conditions in an afternoon. You can also use the same platform method for multiple molecules—no need for product-specific methods. That means you can standardize platform methods across product development and QC, so you'll save time and costs and get robust and reproducible data. Protein samples are first premixed with carrier ampholytes, additives and pI markers. Samples are separated in a capillary cartridge with electrolytic tanks at each end—one tank is filled with acid (anolyte) and the other base (catholyte). The sample mixture is injected to fill the entire capillary column. Voltage is then applied to the anolyte and catholyte tanks. This creates a pH gradient, which separates and focuses the proteins based on their pI. 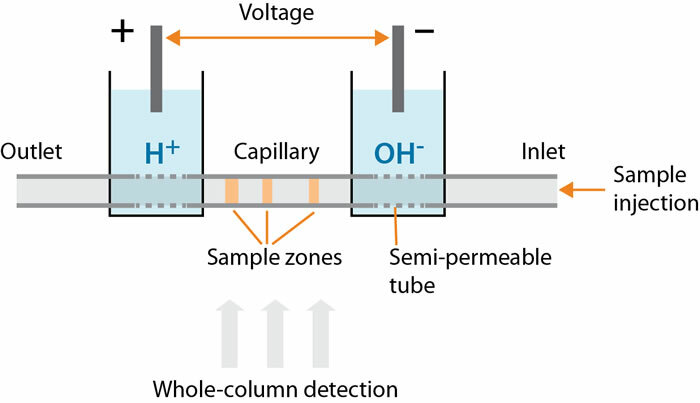 The whole-column UV detector monitors the entire process in the capillary in real time. The focusing time can be optimized in a single sample run, and once it's complete the separation pattern is captured and analyzed. The capillary column is then washed so it's ready to go for the next sample.